Pigmentation is a concern commonly seen at The Skin to Love Clinic which has two main forms; hyperpigmentation and hypopigmentation. In a hyperpigmented skin, patches of your skin become darker than the surrounding skin; this can show itself in the form of sun damage, sun spots, freckles and Melasma, also known as ‘the mask of pregnancy’. Hypopigmentation is the opposite to hyperpigmentation, areas of your skin become lighter in colour than usual; this can sometimes be a result of sun damage or the skin disease, Vitiligo. 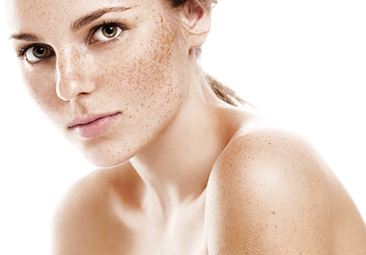 Skin of any colour, genetic or racial background can suffer from pigmentation concerns. A common misunderstanding is that the darker the skin colour the less likely it is to suffer from sun damage and pigmentation problems; this is incorrect. All skin types are susceptible to UV damage and therefore pigmentation issues; in fact, the more melanocytes (the cells which give your skin its colour) found within the skin the more likely they are to be stimulated and create an uneven skin tone. As with all skincare concerns, it’s important to have your skin thoroughly assessed prior to treating any form of pigmentation. Amongst other things, it must be established how deep or superficial the pigmentation is and if the pigmentation is hormonally induced or not as this will indicate how your pigmentation can be treated safely. It is important to note that reducing some pigmentation may not be a quick process and, regardless of the type of pigmentation, using a high factor SPF daily is vital in supporting your results and helping to prevent new pigmentation issues from arising. Prescription-only Obagi Nu-Derm system which is designed specifically for Melasma. If you would like to discuss treatment for your pigmentation, please do not hesitate to contact our friendly team who will happily arrange a consultation for you.